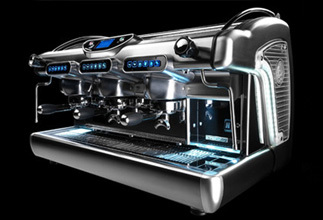 Galileo is the latest model designed and manufactured by BFC Italy. Its innovative energy saving system can maintain both temperature and pressure constantly in an elevated enerey saving manner, yet continue to produce the finest cup of coffee for your enjoyment. T.C.I – Temperaturacontrolloindipendente (separate temperature control) – Electronic coffee temperature control device with separate boiler for each group. Separate steam boiler, with hot water dispensed from heat exchanger.